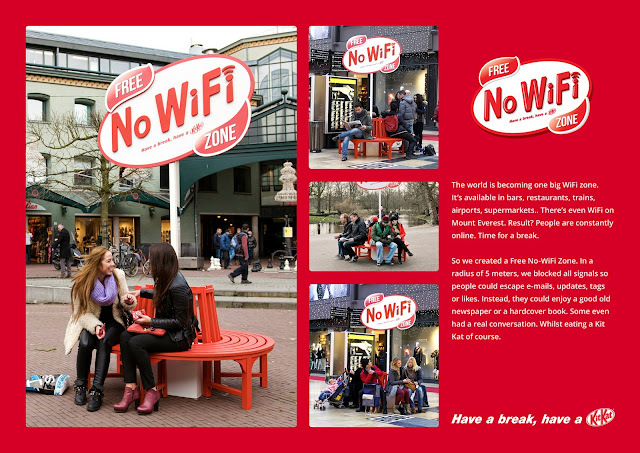 Free WiFi is available almost everywhere we go. People are constantly online, busy with their electronic gadgets all the time. Kit Kat have seen an opportunity to give people a break. So instead of offering Free WiFi like every other brand, the company created a Free No-WiFi Zone. A big sign with a small WiFi jammer that blocked all signals within a five meter radius. People was also encouraged to read a newspaper, a real book or have a genuine conversation again. All while munching on a Kit Kat. Literally giving people a break!